Date Added: Tuesday 10 November, 2009 by Sascha H.
Having owned this jacket for the better part of a year now, I have to conclude that it is clearly the best (clothing) investment I have made. It serves me admirably as an (almost) every day jacket, and, although that might be a bit shallow, I have actually grown quite attached to the jacket. Having ordered it a tad-bit longer than the prototype in the pictures, or the jacket in the movie, it is quite practical, as well as still rather pleasing to the eye. 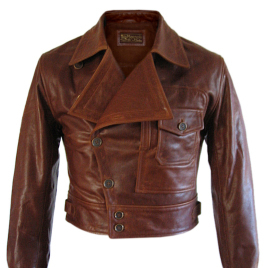 Workmanship is excellent, leather quality superb. Although I might sound like I am fawning, it really is that good!.. Date Added: Tuesday 23 September, 2008 by Alexander G.